Variety is the spice of life. 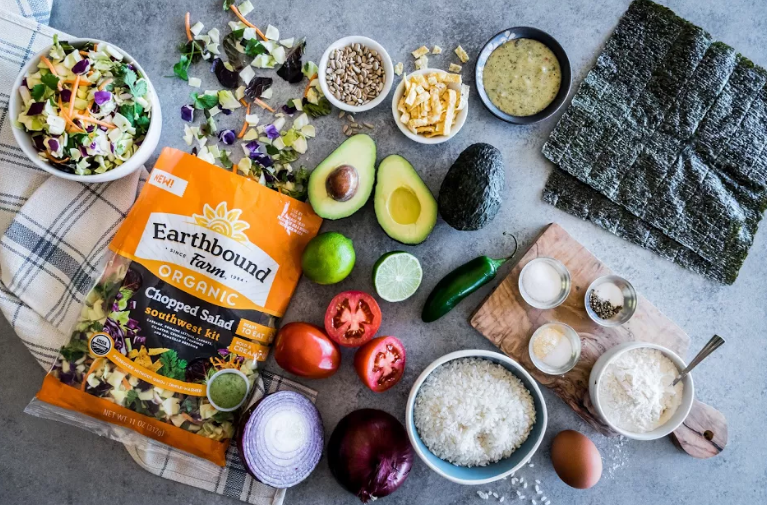 Part east asian, part southwestern, and every part delicious, these vibrant wraps blend flavors, textures and cultures from all over the globe. Crispy avocados seasoned with garlic rest on a foundation of traditional sushi rice. We use the contents from the Earthbound Farm Organic Southwest Chopped Salad Kit to make a wonderful filling: with purple and green cabbage, romaine lettuce, carrots, and cilantro, this nutritious kit also contains a tangy tomatillo dressing along with sunflower seeds and tortilla strips for a crunchy garnish. 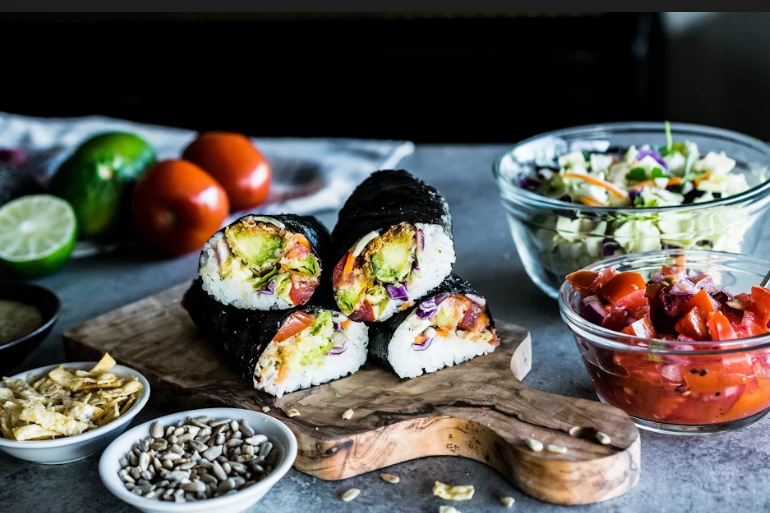 Topped with fresh homemade pico de gallo and rolled up in nori seaweed, these flavorful wraps combine traditions from international cultures, and are welcome in our kitchen with open mouths anytime. These crispy wraps are so easy to make, soon you’ll be eating them by the hundreds too. First you just chop a few vegetables to make a fresh pico de gallo salsa. Then while your rice is simmering, you bake the avocados: perfect for salads, sandwiches, or burritos, we can’t wait to start adding their addictive crunch to everything. And assembling these colorful creations is a breeze. You just spread some rice on a sheet of seaweed, top it with the tangy tomatillo dressing, a handful of greens, the crispy avocado, a scoop of spicy pico de gallo, and the crunchy salad toppings. Roll it up like a burrito, and you have a perfectly portable snack, ready to inspire some envious co-workers. Have fun and get creative when filling your wraps, because no matter how they look, it’s what’s on the inside that truly matters. While we used the Southwest Kit for this recipe, they also make BBQ Ranch and Asian - of which both would make wonderful substitutes! Combine the ingredients in a small bowl, toss to combine, then let rest for a few minutes to allow the flavors to meld. Taste for salt and lime, and adjust as needed. Place the rice in a fine-mesh strainer and rinse until the water runs clear, then let drain. In a medium saucepan, bring the 1 3/4 cups water to a boil over high heat, then add the rice and stir to combine. Let it return to a simmer, then cover the pan, lower heat as low as it will go, and cook for 15-20 minutes, until the rice is tender and the water is absorbed. While the rice is cooking, combine the vinegar, mirin, sugar, and salt in a small bowl or measuring cup, and stir to dissolve. When the rice is done, remove the lid, and stir gently as you pour in the vinegar mixture. Stir to coat the rice evenly, then set aside to cool. Preheat oven to 400°F/204°C, and line a baking sheet with parchment or a silicone baking mat. Place three shallow bowls next to the baking sheet, forming an assembly line: in the first bowl, combine the flour, garlic powder, and salt, and whisk to combine. In the second bowl, place the egg and whisk with a fork to blend. In the third bowl, pour the panko breadcrumbs. Cut the avocado in half, remove the seed and skin, then cut each half into 4 slices. Dip one slice in the flour mixture, coating it evenly on all sides. Then dip it into the egg, ensuring that every side is wet. Then dip it into the bread crumbs, tossing it in the bowl until it is completely coated in crumbs. Place the slice on the prepared baking sheet, and repeat with the remaining slices, arranging them an inch apart. Drizzle a teaspoon or two of olive oil over the slices, then bake them for 20 to 25 minutes, until crispy and golden brown. Open the Salad Kit, and separate the components: the salad greens, tomatillo dressing, sunflower seeds, and tortilla strips. Place a sheet of nori seaweed on a dry cutting board. Place a few spoonfuls of rice on the nori, near the edge closest to you, making a layer of rice about 1/4-inch thick that fills about 1/3 of the sheet, leaving the top 2/3 of the sheet empty. Over the rice, drizzle 1/4 of the tomatillo dressing, then top with a handful of salad greens. Arrange 4 avocado slices on top, then top them with a few spoonfuls of pico de gallo. Sprinkle with sunflower seeds, tortilla strips, and another 1/4 of the dressing. Starting at the edge closest to you, start rolling it up until it makes a tube, squeezing gently as you roll to make a tight fit. Once rolled, use a sharp knife to cut the roll in half. Repeat with the other sheet of nori and the remaining filling, then serve, and enjoy! — Mirin is a type of sweet rice wine used for cooking, and is traditionally used when seasoning rice to make sushi. It is commonly available in grocery stores and online, but if you cannot find it, simply substitute an additional 1/2 teaspoon of rice vinegar. — Firmer avocados will work better than those that are overly soft, so look for slightly underripe ones at the store. — You will likely have extra pico de gallo, rice, and salad left over, which can be saved and used to make more wraps later!